Cutting and Lean Muscle Agent. 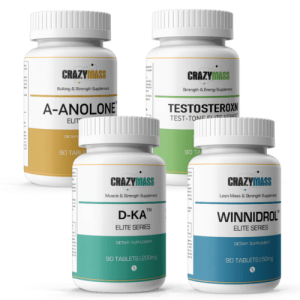 Our 100% all-natural bodybuilding supplement is the alternative to Anavar (Oxandrolone) that works without the harmful side-effects. 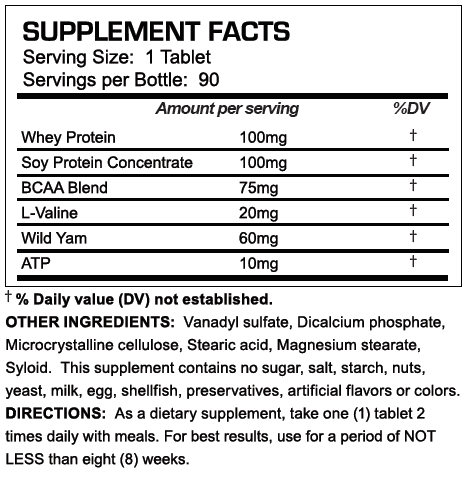 P-VAR is formulated for cutting fat and preserving lean muscle mass. 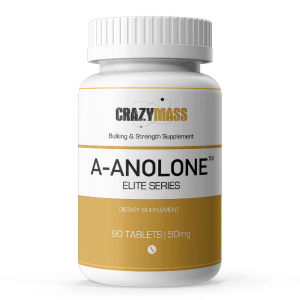 This awesome anabolic is great for both men and women! P-VAR can help increase strength and give you a cut, muscular look without sacrificing muscle mass. It’s powerful enough to be used as a stand-alone supplement, and it stacks well with our other formulas. The CrazyMass Cutting Stack is a set of premium, fat burning bodybuilding supplements which contains P-VAR and three other legal cutting supplements. 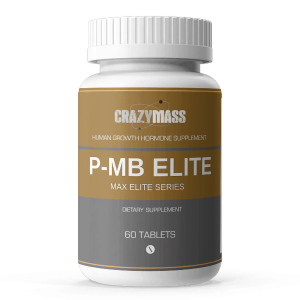 CrazyMass P-VAR Elite Series is essential for cutting cycles, it helps melt away fat and retain muscle while leaving a cut vascular appearance. To learn more about P-VAR’s benefits, click here. 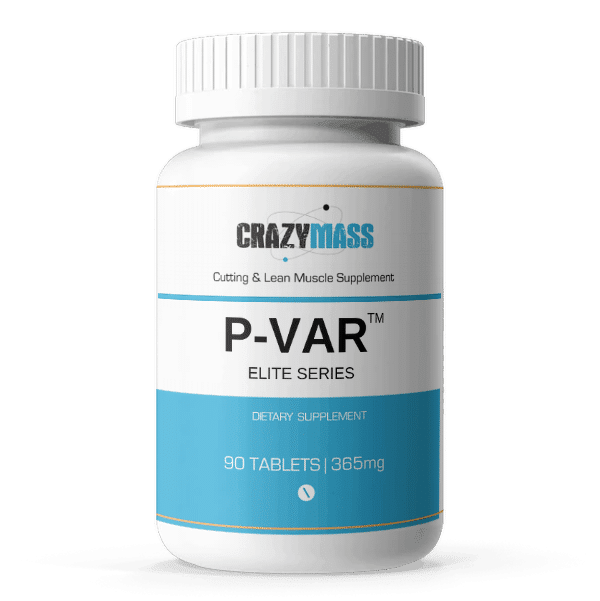 P-Var Elite Series complements ALL of our CrazyMass bodybuilding stacks and steps for taking are found here. Ingredients include Calcium (from dibasic calcium phosphate) Whey Protein Soy Protein BCAA Wild Yam (root) L-Valine, ATP, Cellulose, stearic acid, silicon dioxide croscarmellose sodium, magnesium stearate, FD&C Blue #2, ethylcellulose. I just started taking it for a few weeks. I do feel a difference, however I need to take it longer to see what will happen. So far i like what i see and how i feel. Used it many times over the years, and like it. I use this with T-Bal and Clen. Helps with weight loss, and my workouts get more intense. I use this product with Clen and T-Bal. Works great thus far, and helps keep my weight down. I also great a better workout on it. I dont like how it makes me feel.im tired and un-motivated and lathargic. I wont get it again. I use this product in combination with T-Bal and DeckadroIone. 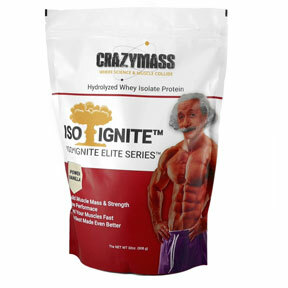 I chose this supplement to amplify my ability to lose fat. Given my age, I also figured this would be the best choice for attacking visceral fat. I also decided to include Paravar rather than some standard over the counter fat loss product because I figured it would work well with the other two supplements while boosting my ability to build lean hard muscle mass. I have already ordered more of the product to complete my 8 week cycle and have experienced impressive results already. While I am only part of the way through my first cycle, I can say that I’m surprised and pleased with how quickly I am reaching my goal. Combined with my exercise routines, the other two supplements and a cleaner diet, I see changes almost every day. By the end of the cycle, I’m pretty confident I will be right on target. Just got off a 6 week cycle and I am looking CUT ! I was pretty sketch on trying this instead of anavar, but it’s working great !